CSB-820 - CSB Sliding Bearings India Pvt. 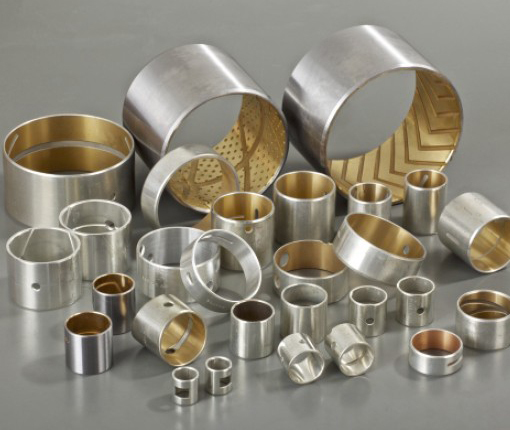 Ltd.
For use in high-speed medium load conditions, as well as a large impact load bearing, such as the engine connecting rod bushings, steering pin covers. Steel shell backed with lead-free bronze lining bearing material for lubricated applications, The bearing have similar performance as CSB800 but without lead elements. This lead-free bronze steel composite features excellent load capacity, high resistance to wear and good resistance to corrosion. The material does not contain lead and complies with the requirements of EU Directive 2000/53/EC on end of life vehicles.